A Serbian spread. Photo courtesy of Manufaktura. Belgrade has been described by some as Berlin-like, but the Serbian capital has a charm all its own. BELGRADE, Serbia – Perched on the confluence of the Sava and Danube rivers, Belgrade feels like a grittier Prague — unpolished but appealing, with a burgeoning design and art scene and an active nightlife. It comes as no surprise then that Serbia's historic capital and largest city draws young travelers looking for affordable and under-the-radar experiences. But what surprised this seasoned (and sober) traveler was the food scene, a mix of old-world favorites and lively establishments. Here's how I took it all in on my first time in town. 1. Any meal that starts with olives makes me happy, even breakfast. The buffet at Metropol Palace Hotel is an Eastern European delight: olives, cucumbers, tomatoes, eggs, mushrooms, and strong coffee with hot mleko (milk). I wait for a table near the window overlooking verdant Tašmajdan Park, where dogs are playing among energetic kids, a nice contrast to the gray city beyond. 2. I head to Legacy of Petar Lubarda gallery (Iličićeva Street 1; +381-11-2660-404) to see works by the famous 20th-century Serbian painter. His art touches on Serbia's changing political and social landscape and is very emotional — the artist's time in a concentration camp during WWII comes across in his paintings, even recent ones. Outdoor seating at Manufaktura. Photo by Judy Koutsky. Kafana Question Mark. Photo by Judy Koutsky. 3. I'm a fan of walking with no particular destination in mind, so I hit the streets of Old Town (Stari Grad) for people-watching. My route takes me down Knez Mihailova, the city's main pedestrian zone and its shops, cafes, and restaurants, then along winding cobblestone streets in Kosancicev Venac, a vibrant neighborhood in the heart of Stari Grad. 4. 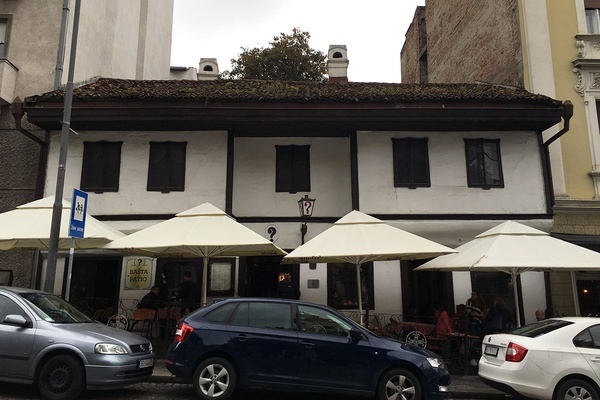 I love walking almost as much as I love good, strong coffee, so I break at Belgrade's oldest traditional tavern, Kafana Question Mark (Kralja Petra 6; +381-11-263-5421), the place with the "?" above the door. The restaurant, located across St. Michael's Cathedral in the heart of Old Town, was built in 1823 and retains its original interiors. Many order Jelen Pivo here, the local beer, but I go for Turkish coffee, for which the place is known. Since the weather is nice, I sit outside for fresh air. Everyone smokes here, and sitting inside is to be engulfed in cigarette smoke fairly quickly. 5. 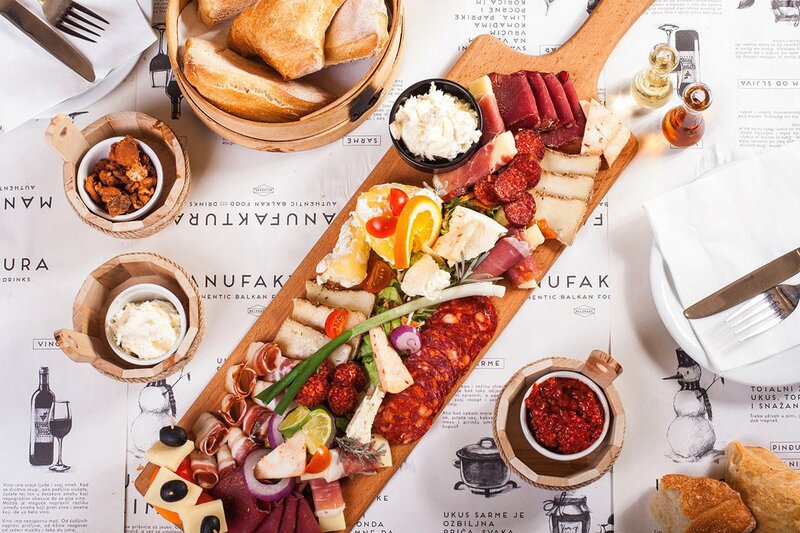 Lunch at Manufaktura is a spread of Serbian mezze: proja (cornbread), gibanica (spinach and cheese filo-dough pastry), kajmak (cream-cheese-like condiment for pita and meat), prosciutto, bacon, feta, smoked cheese, and unforgettable ajvar, a delicious roasted red pepper spread. 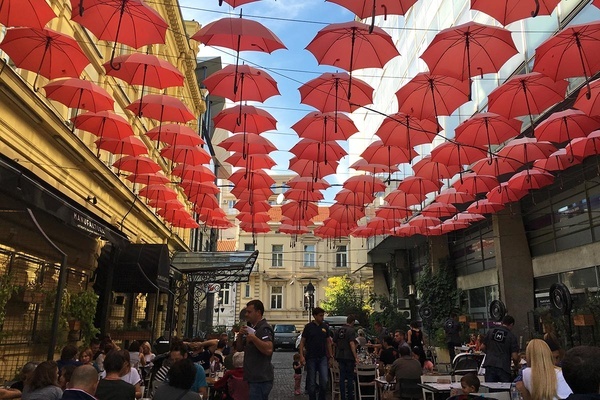 The hip restaurant has outdoor seating in the heart of a pedestrian walkway under a sea of red umbrellas, making the people-watching almost as good as the food. 6. Belgrade architecture is an interesting mix of Eastern bloc buildings and beautiful 20th-century designs. 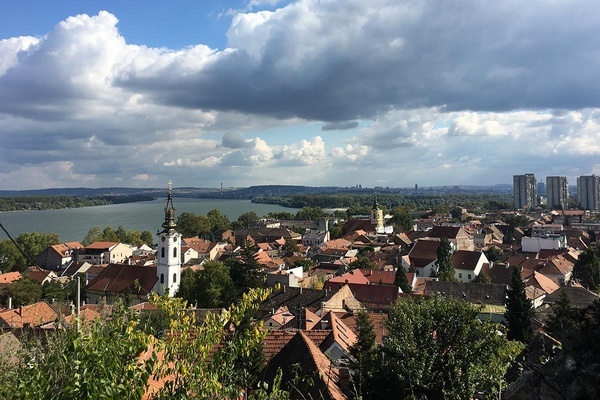 I walk to Belgrade Fortress, also known as Kalemegdan Fortress, which has one of the city's largest parks and some of the best views of the Danube. From here, I visit Museum of Yugoslav History, where I snag some quirky Soviet-era memorabilia from the gift shop before moving onto House of Flowers, Josip Broz Tito's Memorial. 7. Turkish coffee is drunk regularly throughout the day, and I'm happy to comply. 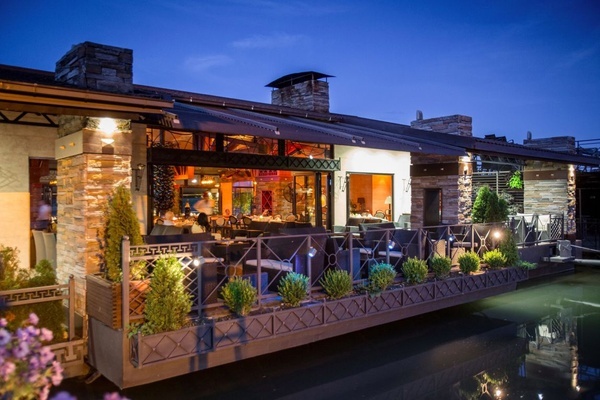 This time, I have it at Amphora River Cafe, a splav, or floating restaurant. Unique to this region, splavs are at the heart of nightlife, and are also great places for coffee or lunch during the day. In the evening, music is loud and the scene is lively. Since it's on the water, there's no bothering the neighbors. 8. I gravitate towards Church of Saint Sava, which can be seen from many points in the city and is reminiscent of Hagia Sophia in Istanbul. Construction on the famous church started in 1935. The exterior was completed in 2004, but the interior has a long way to go. When finished, the space will hold more than 10,000 people and host one of the largest collections of mosaics in the world. Where the Sava and Danube met. Photo by Judy Koutsky. A splav. Photo courtesy of Amphora River Cafe. 9. Dinner is traditional Serbian cuisine (think lots of meat) at Tri Šešira. The historic restaurant has two orchestras that play folk music and is filled with locals young and old, speaking and laughing at the top of their lungs as they spend hours at the dinner table. I have pork, beef, chicken, and veal all on one skewer, known as Milo's Sword, and revel in the atmosphere. 10. I don't drink, but I stop into Rakia Bar for a lesson on the famous national drink of Serbia. Rakia, I learn, can be made from all kinds of fruit and spices including pears, quince, raspberry, honey, lavender, and thyme. The long, narrow bar serves over 54 varieties, including thirteen of their own homemade products, but the crowd favorite among locals and travelers alike is plum. How's this for a fun fact: Serbia is the world's second largest producer of plums. Air Serbia flies direct from New York's JFK to Belgrade Nikola Tesla Airport (BEG). Belgrade is very walkable. Taxis are cheap, but make sure to get into an official one. They have "TX" at the end of their license plates. Locals don't eat lunch until roughly 3 p.m. and dinner until 9 or 10 p.m. Plan your day accordingly, otherwise you'll be eating at an empty restaurant.